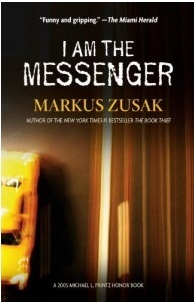 I am the Messenger- Markus Zusak. The beginning- what a hilarious opening. Hopefully I’ll never be caught in the middle of a bank heist, but I just know that if I ever were, that is what it would be like. Marv and Richie! The Doorman. Australia. Pa-pa-pa-poker faaaace. Mystery. (Most of) The messages were beautiful and made my little northern ice-heart melt. I am still undecided about whether I liked Ed, I’ll discuss this more in the hero section. Even though the whole idea of the book was fantastic and so original, I hate to say it failed in the execution. Whether it was just me, I’m not sure, but I have NO idea what the ending was all about or… actually, what the whole ‘message’ of the book was all about. Also, the logistics are absolutely ridiculous. I mean, I don’t mind suspending my disbelief… but if I was going to suspend my disbelief for this book I’d probably need a crane. Also, the love story. YAWN. I know there has to be an element of cluelessness in books like this so the author can develop the story properly… but this was silly. I don’t want to end on a negative tone so I will say a few things about what I liked about Ed. He treated The Doorman, aka the second best dog in literature (Manchee still has my heart), with the respect he warranted. He did deal with crazy men in balaclavas turning up in house very bravely. He likes Bob Dylan. He was very sweet when it came to some of the messages, particularly Sophie, Angie, Marv and the Tatupu. Oh, and I’m always fascinated by people who can play cards without inadvertently launching into a game of 52 card pick-up. Seriously, I can’t even play Snap. I’ve said it before and I’ll continue saying it until all the authors in the universe heed my infinite wisdom: A book does NOT need a love interest to be a good book. I loved Marv and Richie. One of my greatest weakness in life (I do have a few) is a boy who defends his run-down car to the death, so Marv and his blue Falcon was like cat nip to me. So many of Marv and Ed’s exchanges made me laugh so loudly and I could just imagine boys their age talking like that. But my Marv keeps his cards close to his chest. I don’t want to give anything away but Marv’s message was my favourite part of the whole book. It came at the point in the book where I had pretty much written it off, so I was completely surprised when I found myself being a bit choked up! I also really liked Richie but I just wished he had been in it a bit more because I think his story line was great. I also LOVED that he had a Jimi Hendrix tattoo on his arm… that looked like Richard Pryor. Hahaaa. I love authors that don’t just let their secondary characters stand around in the background, leaning against the wall and having a cigarette break. I love a metaphor but I feel like I was cheated a little on that front by this book, so I’ve chosen a song brimming with metaphor. And it’s all linked to card suits as well! Perfecto. People who haven’t read The Book Thief… your high expectations will be dashed. DASHED I SAY. People who play cards. People who have always wondered whether driving a taxi is more glamorous than it seems. People who will not hear a word against their beloved ride even if it is a danger to humanity. People who like Zola Budd. People who like books that are a mixture of The Christmas Carol and PS. I love you… except not as good as the former and not as painful as the latter. People who have always wanted to find themselves in the middle of a mystery with anonymous clues being dropped off at their door. People who have always been too nervous to give their dog caffeine but have always been tempted… just to see what happens.